On April 1st, 1964, Plymouth introduced the Barracuda, a compact fastback based on the 106-inch wheelbase Valiant model. Sales were lukewarm. Two weeks later, Ford debuted their new compact model, the Mustang. Affordable and stylish, it's good looks and youth-oriented marketing helped make it enormously successful. A performance model, the Mustang GT, soon became available, giving the buyer a quick-ratio gearbox, stiffer front coils and rear springs, front disc brakes, and the K-code 271 horsepower 289-cid V-8. More than one-million Mustangs were sold in the first eighteen months of production. Because of its popularity, and the fact that it inspired so many competitors, the Mustang sits in automotive history as the original Pony car. One of the reasons the Chevrolet Camaro did not arrive until 1967 was that many GM executives believed the rear-engine, air-cooled Corvair could compete in sales against the Ford Mustang. The Camaro quickly made up for lost time with the potent Z-28 package, which dominated the SCCA Trans-Am circuit in 1968 and 1969. Whereas a Pony Car is small, a Muscle Car is somewhere between a mid-size and full-size car. Most Pony cars had a unibody with a front sub-frame. All Muscle cars, like the Dodge Charger, were full-frame cars. Always to have identity issues with its pony car stable-mate the Javelin, the 1968-1970 two-seat AMX was powered by a 390 cubic-inch, 315 horsepower V-8, which produced a tire-shredding 415 lb/ft of torque. At 3,000 pounds, the AMX was capable of zero-to-sixty times in under seven seconds, with quarter-mile times under 15 seconds. The second-generation Barracuda, now called the Cuda, was produced from 1970-1974. No longer Valiant-based, the Cuda was very different from the earlier models, with 426-cid Hemi and 440-cid versions available. Designed to compete with the more upscale Cougar, the Dodge Challenger also arrived in 1970. With a longer, 110-inch wheelbase, larger body dimensions and more luxurious interior, the Challenger was aimed at more affluent young American buyers. With emission regulations and no-lead gas already bringing about lower compression ratios, Pony car sales started falling after 1970. Performance faded as emissions standards and safety concerns increased. The 1973 U.S. Oil Crisis made the gas-thirsty Pony cars fall further in the marketplace. The Dodge Challenger, Plymouth Cuda, and AMC Javelin were gone after 1974. GM's Camaro and Firebird would continue until 2002. The RWD Mercury Cougar continued until 1997, and brought back in 1999 as a front-wheel drive model powered by a DOHC 24-valve six-cylinder engine. Four years after the 1974 Challenger was discontinued, Dodge revived the Challenger name in 1978 for a version of the Mitsubishi Galant Lambda coupe. The car retained the frameless hardtop styling of the old Challenger, but was powered by an inline four-cylinder instead of the six and eight-cylinder engines of the first-generation Challengers. In 2008, production started on the third-generation Dodge Challenger. Many design cues were adapted from the 1971 Challenger R/T. 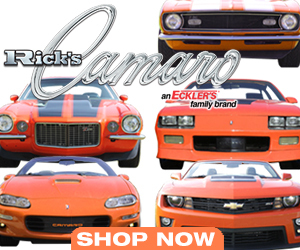 After 35 years of continuous production, the Camaro was discontinued in 2002. The all-new, fifth generation Camaro debuted in 2010. The Ford Mustang has been in continuous production since 1964. Although originally called pony cars, the present-day Ford Mustang, Chevy Camaro, and Dodge Challenger are now considered muscle cars. For a long-term project to be completed, you need to have the proper mindset. My E-book offers practical tips to help you get on track - and keep you on track with your project car. Read and benefit from my 30+ years of garage projects and old car restorations. Topics include planning, ordering parts, overcoming obstacles, and staying motivated.